Tan Sri Dr. Munir Majid, President of the ASEAN Business Club, Dato’ Sri Mustapa Mohamed, Minister for International Trade and Industry of Malaysia and Pongpiti Ektheinchai, Head of International Relations of Stock Exchange of Thailand as panelists discussing efforts and challenges in strengthening private sector’s role in the AEC 2025 Vision at a dialogue session ASEAN Business Club and regional companies expressed support for the ASEAN Economic Community 2025 Vision to realise a highly integrated community with a peoplecentred agenda. They welcomed the strengthening of private sector’s role in the next ten years of ASEAN Economic Community building. Over 150 multinationals, regional businesses and media gathered today in Kuala Lumpur in a special dialogue focused on ASEAN Economic Community 2025, jointly organised by the ASEAN Business Club, CIMB ASEAN Research Institute and Ministry of International Trade and Industry of Malaysia. In the coming decade, ASEAN has committed to institutionalise within each body a consultative process with lead private sector associations and business councils to support the implementation of various sectors. ASEAN has identified four prioritised sectors, namely retail (including ecommerce), agrifood, healthcare and logistics for the removal of nontariff barriers. “Private sector engagement with leaders and ministers in the past has seen insufficient progress in the removal nontariff barriers. The next phase must focus on tangible outcome, with the private sector working through Asean bodies from the bottom up as well. We call for the inclusion of private sector experts in the Asean policy making process,” said Tan Sri Dr. Munir Majid, President of the ASEAN Business Club. 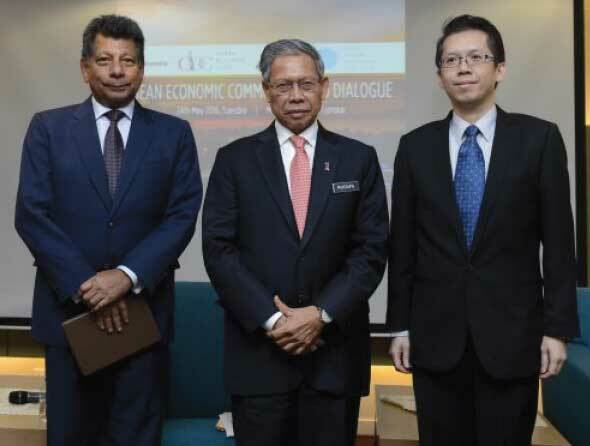 At the dialogue, Minister for International Trade and Industry of Malaysia, Dato’ Sri Mustapa Mohamed presented key priorities of the AEC 2025 Blueprint which was released during Malaysia’s chairmanship year in 2015. “The AEC is still a work in progress. There is an urgent need for us to transform ASEAN’s working mechanism and deepen economic integration. We have to be guided by a broader vision of a more inclusive ASEAN. This successor document outlines the strategic measures to be undertaken which will ensure ASEAN becomes a highly integrated and remains a cohesive economy, accords priority towards enhancing economic connectivity, promotes innovation and inclusive growth, and to continue to strengthen linkages with trading partners, regional and international economic groupings,” said the minister. According to Dato Sri’ Mustapa, ASEAN will release the detailed action plan of the AEC Blueprint 2025 by the end of this year. The expeditious implementation of the new AEC Blueprint measures will be critical in ASEAN’s efforts to remain a hub for global economic activities. Also speaking at the forum was Pongpiti Ektheinchai, Head of International Relations of Stock Exchange of Thailand. As at Feb 2016, the ASEAN Exchanges has US$2 trillion combined market capitalization of over 4,000 companies from 7 exchanges of 6 ASEAN countries. The ASEAN Exchanges’ implementation pillars are to promote and market ASEAN as an asset class, and to enhance connectivity by linking all ASEAN Exchanges through the ASEAN Trading Link.